Krazy Krouse Kids: Go Tigers! 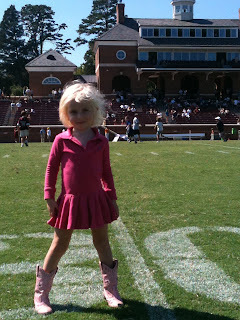 Last Saturday we went out to Hampden-Sydney to watch H-SC play Sewanee. We stayed until halftime as that was about all the kids could do. Tucker enjoyed seeing the tiger mascot and let the tiger hold him. I really wish that I had a picture of that...it was C-U-T-E! Caroline, on the other hand would not even give the tiger a high 5. She stayed close to me when the tiger came around. When the announcer would say "Sewanee" on the loud speaker both kids would look at me and say "Mom...he just said Sewanee!" They were a little confused when he would say "timeout Sewanee" or "timeout Hampden-Sydney." Caroline and Tucker looked at me and asked "why did he say timeout?" Of course they assumed that somebody had done something wrong!